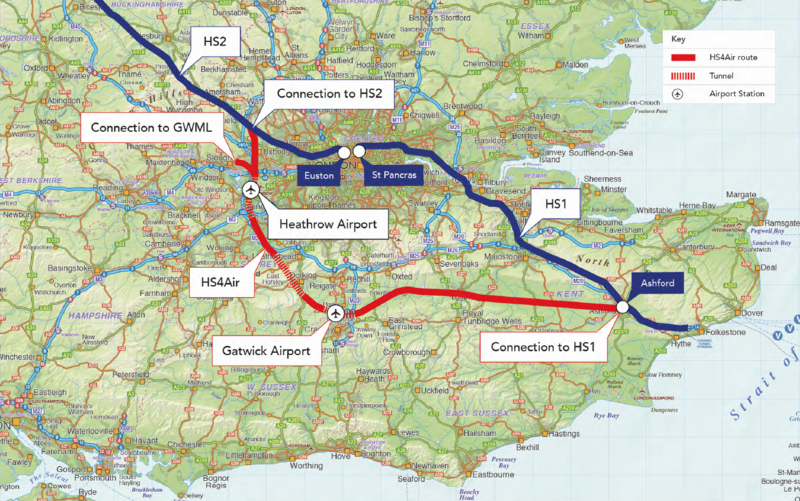 Named ‘HS4Air’, the proposed £10 billion railway will connect HS1 at Ashford to HS2 North West of London with stops at Heathrow and Gatwick airports and a spur connection to the Great Western main line (See map below). The rail route would minimise its environmental impact by following the M25 west of London, tunnelling under sensitive rural environments and re-using and upgrading the existing railway between Ashford and Tonbridge. By connecting Britain’s two high-speed lines to the west of the capital, developers say HS4Air will remove an historic barrier between regions north and west of London to mainland Europe. And by taking passengers and freight out of London that does not need to pass through, HS4Air is expected to release capacity on the congested London rail network. The idea for the new high-speed line has been developed by Expedition Engineering with architects Weston Williamson + Partners (WW+P) and consultants Turley. Birmingham-Paris: 3 hours (Currently 3 hours 50 minutes by air). 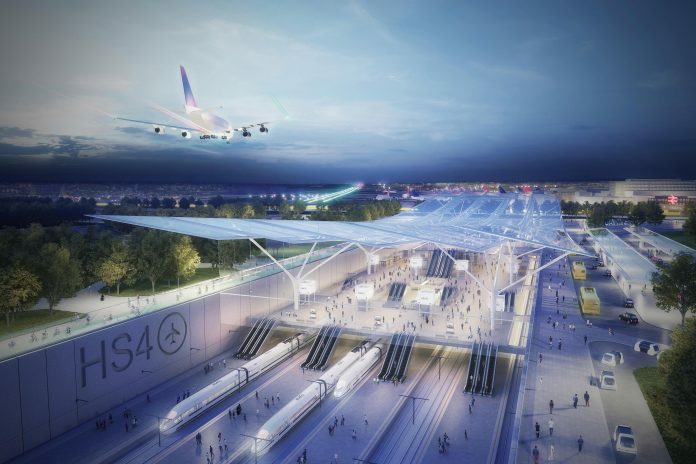 WW+P associate partner Nick McGough said: “HS4Air takes the problem of linking HS1 with HS2 and turns it into an opportunity in by-passing London entirely whilst better connecting the UK’s two largest airports and the country generally through high speed rail. I doubt there are enough paths on HS2 to run enough through services to justify this. Three trains a day from each of Manchester, Leeds and Birmingham to Paris and one from each to Brussels could be managed. But I don’t see the paths for direct services to the airports with any kind of useful frequency. After landing, would you wait for a train that runs three or four times a day, or hop on Crossrail (every 15 minutes) and change at Old Oak Common for a train every 20 or 30 minutes to your destination? Exactly. A through-train from Manchester to Paris is different, as people can plan their whole journey around the timetable. The better option would be to build another couple of platforms at Old Oak Common and a terminus there so you can run an Old Oak Common-Ashford shuttle service every few minutes and get passengers to use HS4air for HS2/airport interchange rather than crowding them onto Crossrail (or Thameslink at St Pancras for those going to Gatwick). Then you can combine an HS4 air service that runs every 5-10 minutes with an HS2 service every 20-30 minutes. You’d still want to have the connection to HS2 for the international services and for whatever through services you do run. In France, the CDG airport station seems to support more or less one TGV an hour to Brussels via Lille, and another going South via Lyon to different destinations (Marseilles/Nice/Montpelier), plus more on alternate hours and in the peaks (Strasbourg, Rennes, Bordeaux). Some trains run in multiple and split to different destinations later on. Airports are designed for hanging around in, and if you have luggage/children/elderlies Crossrail and another change at OOC won’t be that appealing versus stopping for a decent lunch (say). Heathrow and Gatwick also operate frequent flights to popular destinations; if you’re travelling a long way to the airport you choose the flights to match your train journey. Even if this proposal could only take 1tph on HS2 and 1tph on the GWR line I think it would work. You could send one of these through the tunnel each hour and terminate the other at Ashford. At the other end it’s Bristol with some extensions to Cardiff and Birmingham with rotating extensions to Manchester/Liverpool or EMids/Leeds. Then you augment with a 2tph “local” service from Ashford to Reading. Actually building it though? Not convinced it could happen for a very long time. Excellent idea, and one that I’d thought of myself! What I’d also suggest is maybe building a line off it to the South Coast (HS5 perhaps?) possibly connecting to the existing network around Eastleigh from where trains could run to Portsmouth and Southampton, thus freeing up capacity on the Cross Country route. It’s just so frustrating that these things seem to take so long in this country. HS1 opened throughout in 2007, and if this was the continent we’d already be building HS4Air by now! Yes! Southampton to Paris, Portsmouth to Paris and Brighton to Paris. More links are needed. A clever scheme. For a relatively small amount of new track it provides a link between Heathrow and Gatwick and the possibility of direct services to Europe from the West Coast Mainline Stations and those on the Great Western line. Bristol or Birmingham to Paris, Amsterdam or Brussels direct is very appealing. With this proposal HS2 makes more sense. There is a cheaper and more viable way to achieve this. a) Link HS1 to HS2 via through platforms (built 10m below ground level as a tunnel curving across Euston’s platforms (above tube lines) & cut & cover down Phoenix Rd with platform ends close to Thamelink & Kings Cross. The track would then curve & rise under St Pancras to join HS1 tracks as they exit St Pancras. b) combine Airtrack, the Western Link and Heathrow spur into ONE scheme of tracks alongside the M25 linking the Chiltern line, HS2, GWR, Crossrail and SW trains as one line from Denham to Staines via platforms by T5 and with junctions from the GWR and existing Crossrail at T5. Current plans force HS2 users from Heathrow & over a THIRD of its London & Home Counties market to waste 30-45 minutes travelling to Old Oak Common to travel north – ie enough to DOUBLE journey times to Birmingham, add 66% to journey times to Manchester, Leeds, York etc and add almost an hour to Scotland. 1) Halve journey times from Heathrow or SW London or Hampshire, Berkshire, Surrey etc to the Midlands, North West, Yorkshire & make Scotland just over 3hrs from Heathrow instead of 4hrs. But the bigger benefit is that this FREES UP 6 paths per hour ACROSS London from Kent, Essex, East London, Paris and Kings Cross/St Pancras to HEATHROW and new links from Woking & Reading & the Chiltern line. Crossrail will just be a slow metro – with sideways facing seats. HS1 – HS2 – Heathrow RAIL Hub would be a FAST M25 RAILWAY across London to allow Javelin and Eurostar trains to Cross London & reach a Heathrow Hub where people could change to trains to Bristol (via Reading) or Southampton etc (via Woking). So that’s far less new track needed (that this HS4air), less cost and more viability. By SPLITTING the southern end of HS2 to serve Heathrow and South London – sending 6 of its 18 trains/hr to Heathrow and Clapham Junction, we create space for 6 trains/hr to CROSS LONDON non-stop from St Pancras Cross (built to straddle the gap between Euston & St Pancras/Kings Cross) and a Heathrow Hub rail station built alongside T5. Its £4b cost could be repaid in about 5 years to then earn £1b per year from a huge 50 million per year markets where half would be extra LONG DISTANCE or lucrative AIRPORT passengers. And that income would also fund capacity improvements through Richmond to benefit Wokingham-Staines-Twickenham-Richmond-Clapham-Waterloo passengers too. We have Climate Change these industries are out of date. Humanity must be more responsible and flexible to our situation and it is essential to protect all natural ecosystems we have left. All building that destroys nature reserves is illegal and these laws need to be applied. Humanity cannot continue to destroy the environment in ever more desatrous ways. The techniques being used by contractors to build HS2 are careless to nature, morally wrong and larger and worse than road building. Must be stopped. Public money is being stollen by this industry against the will of the people. And it’s high time that people came to realise that being the will of the people doesn’t make something right! Put it this way, if we always followed the will of the people with these things then nothing would ever get built! And you can’t claim that public money is being ‘stolen’ just because you don’t agree with how it’s being spent, otherwise virtually everyone would say it. After all, there will always be someone that’ll disagree with something it’s being spent on! Clearly this has been dreamed up by someone with zero railway knowledge and yet another impossible unrealistic pipe dream. To build this would create years of disruption to the Kent main line via Ashford, not only would the Ashford – Tonbridge line have to be rebuilt completely to UIC gauge and 25kv electrification also have they considered the major bottleneck at Tonbridge and to a lesser extent, Paddock Wood? The junctions at Tonbridge are at capacity now, and to create a high speed through line which I assumes takes the Redhill route is unworkable, plus how would Southeasten services integrate with UIC HS trains along the route? This reminds me of the dedicated freight only line planned not long after the opening of the Channel Tunnel to Birmingham and points north which would have shadowed a similar route, had that been built it would have joined the list of many ‘white elephants’ conceived since the opening of the link. My suggestion for such a scheme would be to use the redundant Waterloo Connection at Southfleet Junction, which already points westwards, dive under the Chatham main line then build a dedicated High Speed Line following the M25 which is only about 5 miles from this point, thence as planned. This would have no impact on the existing network, would be a faster route and possibly a cheaper solution? This is just PR. There is more important transit issues than this, that can provide better relief to existing rail routes. I would much prefer another Crossrail or TL type schemes, or just more local regional, line and improvements, which would balance HS2 which is not built. There’s better priorities. This proposal its not about improving commuting in the South East! It is about improving connections between two airports and more importantly improving connections between the South West – Swindon, Bristol, Cardiff, Newport etc. and the Midlands and North West – Birmingham, Coventry, Manchester, Liverpool, Stoke-on-Trent, Preston,etc. – none of which, as far as I know, are in the South East – and Europe. Of course more should be spent on the railways in the north – what has been spent in the South East is a good example of the level of investment that applied elsewhere. I don’t think people realise how much land and nature is being taken away by HS2 and how much this will effect us badly. I truly believe HS2 will never be built but how much damage will have been caused by then? Climate change is happening now. HS2 construction is adding to climate change in a very big way. And surely if anything it’ll help reduce climate change by getting people off aircraft? I sympathise with Sarah Green. The sooner HS2 is abandoned the better. And end up with gridlock on the WCML?